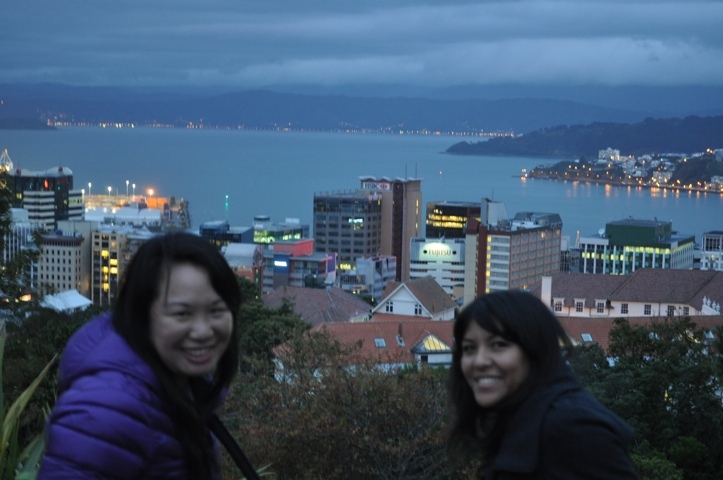 Today finds our sore bodies in the small city of Wellington. 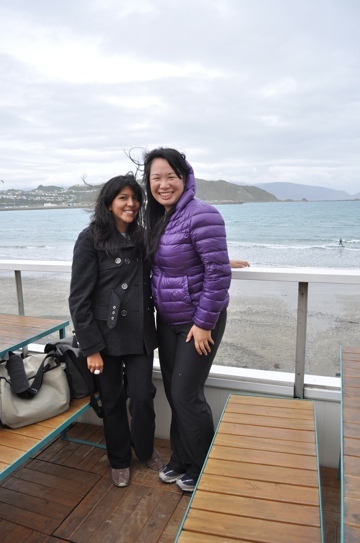 Wellington is also known as a “windy city”, and it’s definitely lived up to its name! Despite that, we’ve managed to still have a great time here. We arrived on “Easter Sunday” and found out that New Zealanders take Easter very seriously. Stores close for Good Friday, Easter Sunday, and they also have an Easter Monday, which is combined with ANZAC day (commemorating WWII vets), making today a double holiday. As a result, we arrived yesterday to a virtual ghost town. For example, we were in the small suburb town of Kilbirne, looking for a quick bite. The only apparently open restaurants were KFC and Subway. Neither was too appealing to us, but while trying to decide on the lesser of 2 evils, we turned up one street and found 2 Chinese restaurants. Thank goodness for Chinese people always in business! 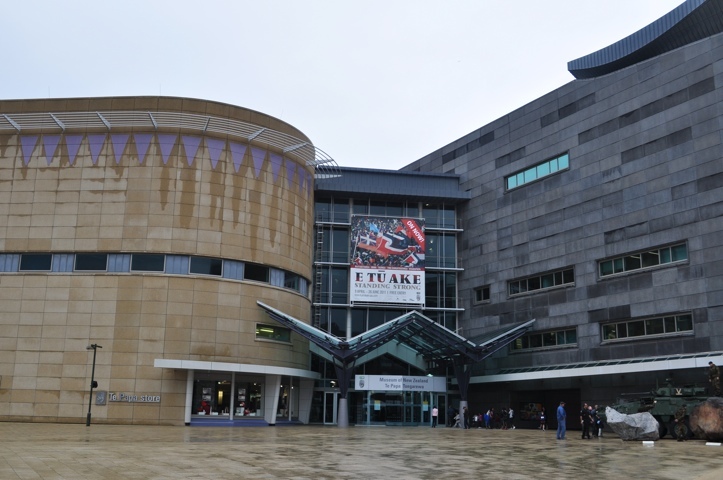 Today, some stores were also closed, but thank goodness, an awesome Wellington museum called Te Papa was open. This museum was massive, with a variety of exhibits ranging from kiwi art to Maori art, to fashion, to marine life, to geological formations. It’s like the Met, the MoMA, and the Museum of Natural History all rolled up into one! There was no way we were going to do it all in one visit, so we didn’t even try. 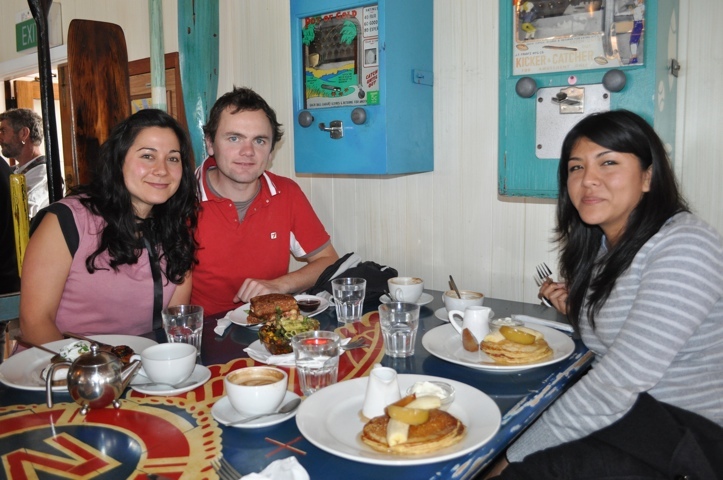 After the museum, we had a very yummy brunch at a former “Life Savers’ Club”, with beautiful views of the beach and kite-surfers. Then, we visited another Wellington gallery, did some shopping, hopped on a Wellington cable car, ate a lamb’s rump dinner (trust me, it tastes a LOT better than it sounds…), and had a pint from a local brewery. I must say, we’ve definitely made the most of our limited time here! Reuniting with Matt, whom we met in Argentina! 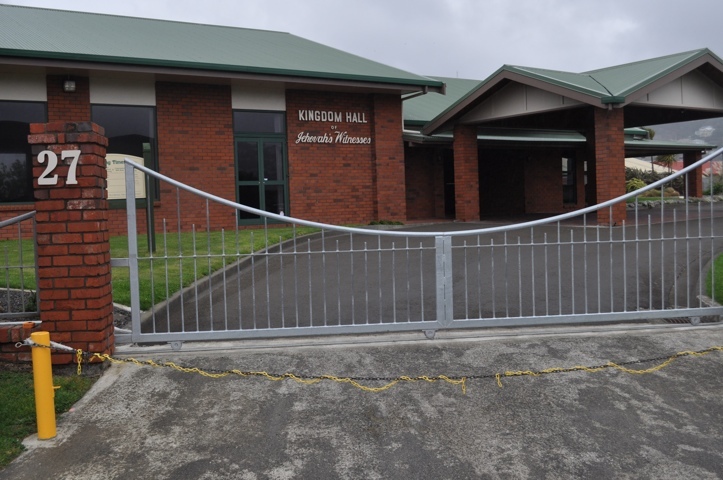 Proof that we tried to visit the Kingdom Hall! The water looks baby blue, even under overcast skies. Is the water different looking because NZ is in the southern most part of the world? Is it Cantonese Chinese food or is it other provinces? How was their food since they have such a huge Chinese population? Miss you! I’ve heard that the water is so blue due to the minerals in the water. It’s gorgeous, even on a cloudy day. I think there’s actually quite a few Cantonese speaking people in Wellington – I’ve heard it spoken quite frequently. The food was pretty good though I only ordered cha siew fried rice – given the type of place it was, I was scared to be more adventurous! BTW, you can tell dad that I’ve frequently been carded when ordering alcoholic beverages. Given that the drinking age is 18, I must look younger than that!